The specialist services they offer include truck and trailer body building, truck chassis modifications, axle fitting, steering conversions and truck crane fitment. The speciality was building trucks to meet each customer’s specific needs and requirements. With highly trained staff of engineering and production professionals, customers were assured delivery of what they asked for, knowing their equipment would meet the highest standards in terms of safety and design. Based in Castlebellingham Co. Louth, the company has been building truck bodies and trailers to the highest standards since 2005. The team have worked hard to build a reputation for quality workmanship, excellent designs and well built products that will be around for a long time. Their products are used by some of Ireland’s leading hauliers, farmers and contractors. "We build truck bodies and trailers that are simply unrivalled in terms of quality, workmanship and performance and are competitive among our competition," said Alan Treadwell who formed the business. “We are very busy at the moment and a lot of repeat custom would make up our client list. In recent years, we have become an N.S.A.I approved body-builder and that has enhanced our reputation even further. “That was achieved three years ago and our work load has certainly increased since then. A lot of the work we obtain would come through word of mouth and we find that is the best form of advertisement. Whether it's a typical truck body product to a specialised one, our team can build your single vehicle or a fleet of vehicles on a delivery schedule that we think will make you satisfied that you've made the right choice. AMT Engineering pledge to continue to manufacture the same quality, dependable, durable product lines that customers have come to expect from them. Moving forward, they will continue to implement new and innovative designs and features and strive to remain an industry leader. "We take pride in working directly with the customers during the build process to meet specific customer specifications and needs." 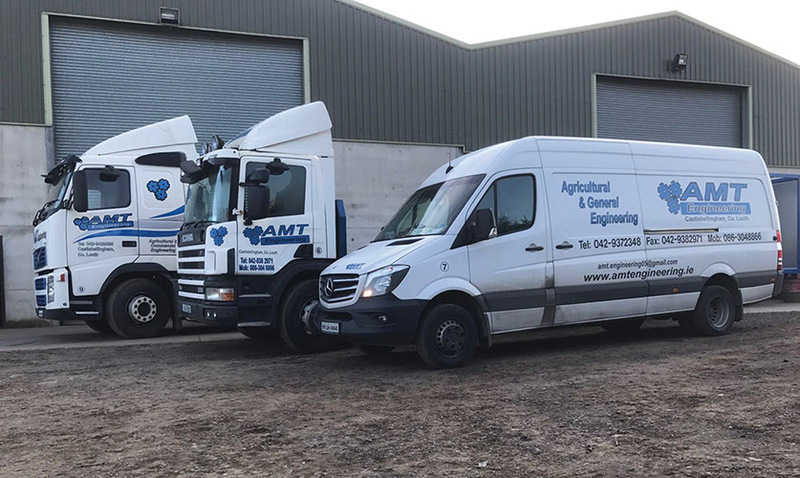 AMT Engineering designs, engineers and manufactures all types of truck bodies and trailers amongst other products to the highest specification and standards, and the quality of their finished bodies and trailers speaks for itself. We have built our reputation on innovative design, excellent workmanship and quality, quality in everything we do. Another string to the company's bow is the fact that they hire trailers to a select set of customers. Flat, extendable and curtainsider trailers are the most popular. A full equipped workshop aids the staff of seven employees to carry out their daily duties to the highest standards possible. “We do invest in equipment on a regular basis, you need to in order to keep the work coming in and give the customer what they want. Alan admits that having a highly experienced staff around makes all the difference in being a success or a failure in this industry. Customers are a lot more price conscious these days compared to before the last recession and Alan added that their aim is to give them what they want at an affordable price. Bodybuilding design starts from negotiations with the customer and acknowledging the customer’s needs.